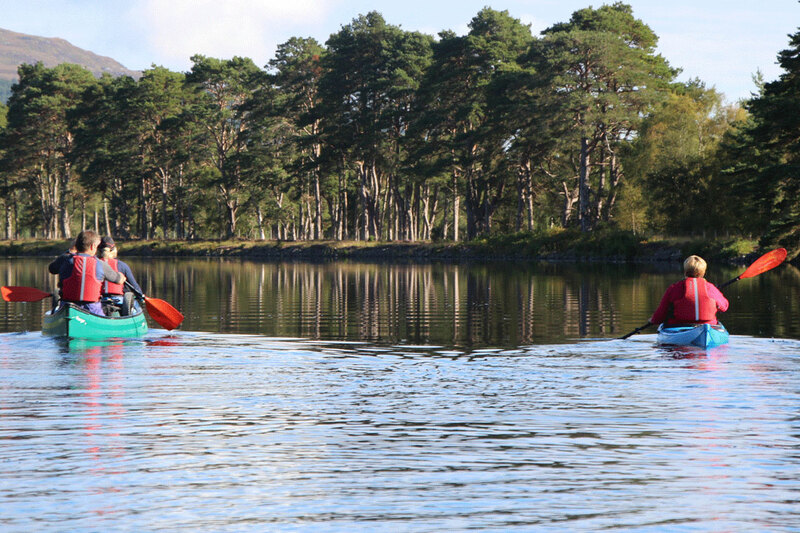 A wonderful expedition by canoe from Fort William in the West to Inverness in the East. Please note that we can run these trips on request for a minimum of 4 people (subject to availability). We may also have available places on scheduled expeditions run for partner companies. Please get in touch for information about other dates. As a local company, the Great Glen is right on our doorstep, so we know it like the back of our hands! You'll travel under the watchful eye of a local guide and will camp along the way. You'll get the opportunity to learn new canoe skills or consolidate what you already know. With stunning scenery, myths and legends and lots of fresh Highland air, this is an expedition not to be missed. We start and finish the holiday from Inverness city centre, making it easy for you to travel to the area by public transport and to choose from a wide range of easily accessible accommodation options the night before we depart. For visitors travelling to the area by car we recommend meeting you at the car park for the Great Glen Canoe Trail (at the foot of Muirtown Locks), where you can leave your car for the duration and it is conveniently parked at our finish point. Please phone us on +44 (0)333 600 6008 for advice on the easiest way to reach Inverness from where you live, or visit the 'getting here' section of our web site. We will meet in car park of the Tesco Metro on Tomnahurich Street, Inverness at 9.00am, before transferring by minibus across the country to Banavie, near Fort William (2 hours). With help from your guide, we’ll carefully pack the canoes and have a practice paddle in the canal basin. Once everyone is happy with steering a fully laden canoe we will paddle around 11km to Gairlochy and the start of Loch Lochy to find a remote campsite to enjoy our first night well away from the bustle of Fort William. Much of the day is spent paddling the length of Loch Lochy (who came up with that name!). Hopefully the prevailing south-westerly wind is blowing and we can rig an improvised sail to speed us along. At the head of the loch we pass through Laggan Locks then paddle a two mile section of canal which takes us into the magical Loch Oich. Here we will change down a gear towards the end of the day and take our time exploring the lovely wooded bays of the loch while we look for a secluded wild camping spot. This is the day that we perfect our 'portaging' skills! After leaving Loch Oich we carry our boats and kit around the small lock gates at Cullochy and Kytra and then briefly touch base with civilisation again as we reach the lovely little tourist-friendly village of Fort Augustus. Here we stop for a couple of hours while your guide re-stocks the food supplies and everyone gets a chance to portage their canoe down a huge set of lock gates, grab a shower and visit a café/pub. On leaving the village we face the daunting prospect of tackling the 36km of Loch Ness. A monster loch in more ways than one. Part way up Loch Ness we will look for somewhere to camp for the night on the quiet Southern shore and maybe cook our dinner on the beach while Nessie spotting. A full day on Loch Ness today. It can get pretty tough going if there is a strong wind blowing – due to the sheer size of the loch it is possible (though rare) to get up to 2metre waves forming. Good job you are in expert hands then! In normal conditions this is a lovely leisurely paddle and we may well have time to land at the dramatic Urqhuart Castle for photo opportunities, and a nosey round the excellent Historic Scotland visitor centre. In the evening we finally reach the head of the loch and find a campsite nearby. Looking back down the full length of Loch Ness, stunning sunsets are common, as are late nights in the Dores Inn to celebrate our last night together and the friendships made. Muirtown Locks sometime early afternoon. It usually takes a wee while to unpack the canoes and to sort out the kit. Once this is done, we will transport you in to the town centre train station where we will leave you with a big bag of smoky, sweaty clothes and an even bigger bag of awesome memories. Awesome Highland scenery as we journey along a major geological fault line. The sense of achievement in crossing Scotland from coast to coast under your own steam. Experience up close the engineering marvel of Thomas Telford’s Caledonian Canal. The fantastic local knowledge of your guide. Paddle the length of Loch Ness and find out the truth about the monster! Please note: if the scheduled dates don't suit your plans please get in touch with your preferred dates and we will be happy to accommodate this whenever possible. Minimum of 4 people.